Essential tracing activities as part of the citrus canker emergency response have again proved invaluable in identifying another infected plant site in the Marrakai area. An additional Restricted Area, including movement restrictions for citrus and host plant varieties and their associated material in the area around the detection, has been put in place. This new Restricted Area, as well as the new Restricted and Control Areas in Katherine following the detection earlier in June, have been gazetted and are available on the department’s citrus canker web page at www.dpir.nt.gov.au/citrus-canker. The Marrakai Restricted Area is within the already established greater Darwin Control Area that was gazetted on 21 May 2018. Northern Territory Director for Biosecurity and Animal Welfare Sarah Corcoran said the infected plant was one of three potted citrus plants. “The infected plant was found on a property in Marrakai that is more than two kilometres from the nearest commercial citrus premises,” Ms Corcoran said. “There are 38 residences in the new Restricted Area in Marrakai that surveillance officers from the emergency response team will now visit to conduct inspections and ensure there has been no spread of the disease. This most recent citrus canker detection is the eighth confirmed infected premise in the Northern Territory. “All discovered infected plants to date are potted plants sold within the past 12 months and directly linked to one supplier, which is a positive indicator that there has been no natural spread of the disease,” Ms Corcoran said. “There has still been no detection of citrus canker on any commercial citrus growing properties in the Northern Territory. “The citrus canker emergency response team will continue surveillance and tracing work in line with the nationally agreed response plan which is informing activities over the next six months,” Ms Corcoran said. Northern Territory Farmers Association CEO Greg Owens said he continues to support the science based approach being undertaken by the citrus canker response. “Northern Territory Farmers Association continues to work closely with the Northern Territory Government to keep our growers informed of events as they occur, Mr Owens said. 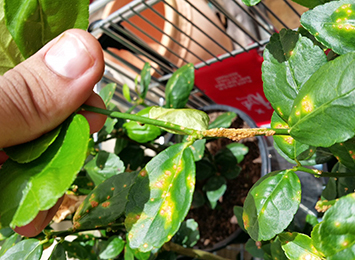 Reports provided by the public are still the strongest available tool in identifying and eradicating the disease from the Northern Territory, and anyone who has purchased or been given a citrus plant in the last 12 months is urged to contact the citrus canker hotline on 1800 931 722. There is also a range of information to aid the public with identification and available reporting options at www.dpir.nt.gov.au/citrus-canker. Thank you everyone who has already contacted the hotline. The citrus canker response team will be following up on all calls as early identification offers the best opportunity of containing and eradicating citrus canker from the Northern Territory.